Where are the Cronkites of yesteryear? I am a pretty big “news junkie” and so I flip among many channels to get my daily fix. With the proliferation of cable news and network news the airwaves are often overrun with newscasters each putting their own spin and flavor to their reporting. I was thinking back to the days of network news when you had a choice of three evening newscasts and that was it. Even though the choices were limited, the newscasters were serious people who presented each story in a very believable way. You actually trusted Walter Cronkite, Chet Huntley or David Brinkley to be giving you the real deal. Things have changed and now news casting is a 24/7 enterprise where you need to flip among numerous channels to get the right story. As this is TopTen Friday, I thought I would present my choice of the ten most annoying newscasters that I’ve come across. This is by no means a critique of journalistic abilities but simply my opinion about each one’s style and personality. 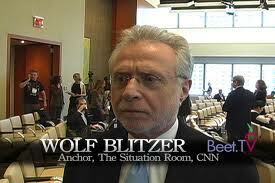 Explain it to the "folks"
Wolf Blitzer Time to get rid of the beard Wolf; it’s starting to look dated. It was ok back in the first Iraq war but now it sort of reminds me of the two Alpine Doofuses who used to yodel “Ricola” during commercial breaks in your reporting. Geraldo Rivera The problem I have with Geraldo is that he’s always trying to break big stories but the hype that precedes them is often much bigger than the story itself. 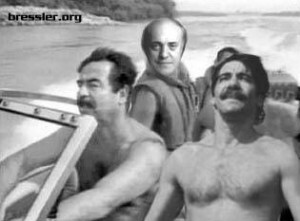 Saddam I need to report on a war! Can you do something? Greta Van Susteren This one I can’t quite figure out. Her show is top rated in the 10 pm time slot, she has great guests and solid stories but I thought being a news anchor was always about the visible and audible. Watching Greta one can’t help notice the plastic surgery gone bad, the constant slurring of words, run on sentences and poor diction. Greta please it’s President “O”bama , and not President Bama. Katie Couric Katie Couric news casts always reminds me of Cheri Oteri and Will Ferrell doing their cheerleader routine on SNL. Katie, you don’t have a school letter on your chest nor a pompom in your hand so please tone down the rah rah delivery. Gimme a C! Gimme a B! Gimme an S! 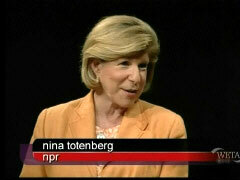 Nina Totenberg She is a well know reporter for NPR, appears on a weekly news show called Inside Washington and drives me to distraction. Since the Juan Williams firing at NPR she has obviously been somewhat muzzled and now resorts to a contemptuous grating cackle when disagreeing with something being said. It always makes me want to throw anything within reach at the screen. hah hah Charles you're so funny! 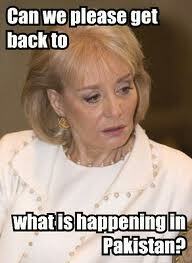 Barbara Walters Barbara reminds me of aging rockers or athletes who don’t know how to retire gracefully. Barbara, I think going on The View is a major step down. Unfortunately you’re no longer Baba Wawa but Blah Blah Blah Wawa. Wait! You don't do news anymore ! 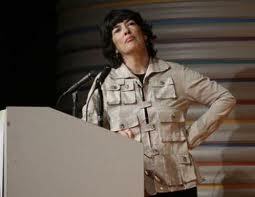 Christiane Amanpour I liked Christiane a lot better when she was reporting from the field dressed in her stylish fatigues or Safari jacket with sounds of bombing in the background. In the studio she looks like she’s trying too hard to be like a man. Out in the war zones it really didn’t matter. Is Muammar Gaddafi in the audience? Jim Cantore I have never seen Jim Cantore standing straight up and dry. 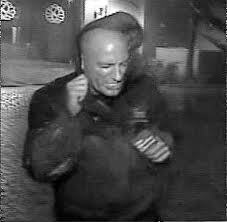 He is always leaning at a forty five degree angle being buffeted by strong winds, heavy rain or snow, while describing the swinging traffic lights and bent stop signs. As most of you know Jim is the lead Storm Tracker Reporter for The Weather Channel where catastrophic news is created by simply looking up to the sky. I’d love to actually see what Jim looks like without a poncho. Who the hell wants to work in kind of weather anyway? Andy Rooney Did you ever ask why a major network would give a 104 year old man a five minute spot at the end of a top rated newsmagazine show? Yep it’s Andy. Does anyone ever really know what he’s talking about or care. Does he have a lifetime contract? Why in the age of HDTV would you do close-ups of him or his office. It’s like putting aging granddad out on the porch to engage passers-by. 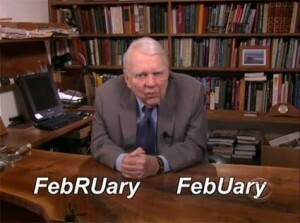 Did you ever wonder about the "r" in February? 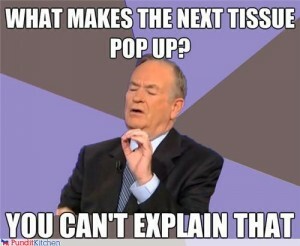 This entry was posted on April 22, 2011 at 2:46 pm. You can follow any responses to this entry through the RSS 2.0 feed. Both comments and pings are currently closed.